Pet Bounce is a homeopathic pain relief for dogs and cats. It is a blend of plant-based homeopathic ingredients. Your pets also suffer from the pain and swelling of arthritis just like you do. The best and least harmful way to cure your pet’s suffering is to treat them with homeopathic medication for arthritis made of natural ingredients. Pet Bounce is the best pain relief for your pet. It is a natural, plant-based blend, designed to alleviate symptoms of joint pain in dogs and cats. Your pet that is affected by arthritis experiences joint pain and inflammation. 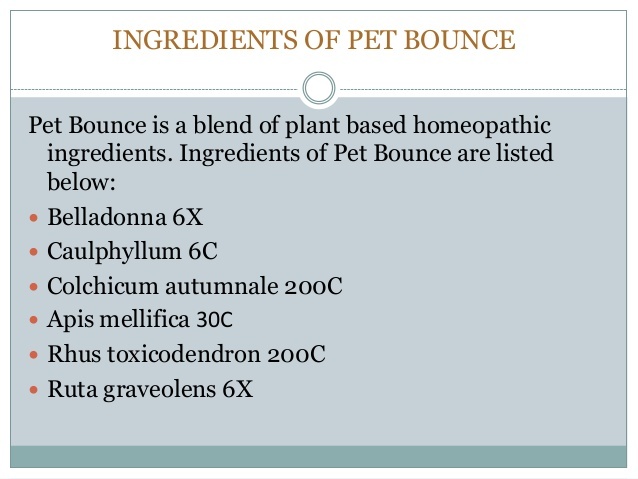 Pet Bounce is produced using homeopathic ingredients which have been used since immemorial time to treat symptoms of joint pain. Pet Bounce helps to remove discomfort, swelling, and stiffness associated with joint pain due to arthritis with few drops in the mouth, depending on your pet’s weight. Pet Bounce is a perfect homeopathic medicine for dogs and cats suffering from arthritis. Apis Mellifica 30C: This is an active ingredient produced from honeybees for homeopathic remedies. Most active ingredient in Apis mellifica is the venom of the honeybee. It is useful in fluid retention and to relieve swelling with inflammation and pain. This has been used in homeopathy since its discovery as a remedy in 1835, Germany. Till now its preparation has gone through several changes to improve its quality. Belladonna 6X: Also known as Deadly Nightshade, Belladonna is a herbaceous eternal plant native to Europe, North Africa and Western Asia. The leaf and root of the plant are used to produce medicines. It has been used by homeopathic experts as pain reliever, anti-inflammatory, and muscle relaxer.Belladonna can block some functions of the body’s nervous system and the bodily functions. Caulphyllum 6C: Caulphyllum is a herb that blooms in early April and is usually found in dense forests across much of the US and Canada. Native Americans used it for providing aid to relieve pain during childbirth and it is also effective in curing stiffness & pain in the joints. Colchicum Autumnale 200C: This autumn-blooming flower is known as autumn crocus, meadow saffron or naked lady. It is famous painkiller to provide relief from joint, muscular and gastric pain. It has an antioxidant quality that is why it is used to treat internal injuries for centuries. Rhus Toxicodendron 200C: Also known as poison vine or poison ivy can be found all over North America in forest areas. Rhus Toxis used to relieve stiffness of various types of stiffness such as one in the neck and back. Many people also find it useful in the treatment of pain due to arthritis. Ruta Graveolens 6X: A plant native to Southern Europe, Ruta is also known as Common Rue, which in olden times was thought to ward off the plague. A garden with lovely ruta plant also looks very pleasant. Ruta Graveolens is used to get relief from joint pain, stiffness & swelling due to injuries to the bone or bone covering tissues. Why An Oral Homeopathic Formula To Pain Relief For Your Pet? Many pets tend to refuse pain relief medication in form of capsule or powder. It becomes really hard for the vets and owners to make the animal eat those medicines. Pet Bounce is widely accepted because of its droplet formula and natural ingredients. The bloodstream quickly absorbs the homeopathic ingredients in Pet Bounce that are in liquid form through the tissues in the mouth. Keeping the dosage on time as scheduled is easy as only a few drops are all that is needed.Pet Bounce liquid has an immediate effect in comparison to the other homeopathic medicine in form of pills or powder. This application process is easy and helps to provide faster relief to animals suffering from pain and discomfort. Human intake can be fatal, in case contact Poison Control Center immediately. Do not use if seal around entire bottle is missing or broken. We take great pride in the quality of our products and feel obliged when you get complete satisfaction from your purchase. We believe in offering the very best value, quality, and selection to our customers.